From Frazier Park, take Frazier Mountain Road and go straight west. Frazier Mountain Road becomes Cuddy Valley Road. Travel west following the signs to Mount Pinos. You’ll pass by, the Lockwood Valley turnoff and Cuddy Valley. At the end of the valley, you will pass a camp sign (Bethany Pines) and shortly after that will be two signs with white lettering. The first is a weathered brown wood sign and has “Pine Mountain Club” on the second line. Then there’s a newer green metal sign with “Pine Mountain Club” on the first line and an arrow pointing right. In a just over a second, you reach the “Y” turnoff; turn right and you’ll be on Mil Potrero Highway. You’re now 4.9 miles from Woodland (the street sign is not large) where you turn right and then immediately turn left onto Mil Potrero Frontage Road. (If you drive to the Village sign, you’ve gone too far.) Turn right into the cul de sac. Ours is the home on the left. 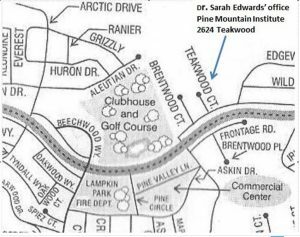 The address is 2624 Teakwood Court. Please contact me if you have other questions about the nature of my practice or my location.